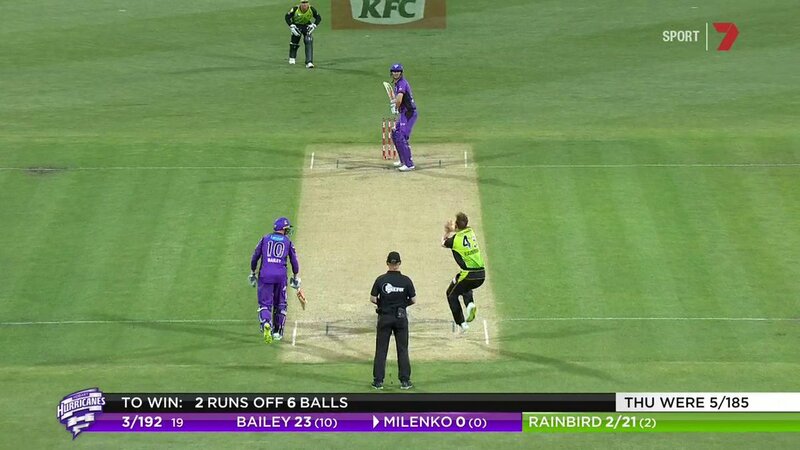 Welcome to our live coverage of the game between the Hobart Hurricanes and Sydney Thunder. 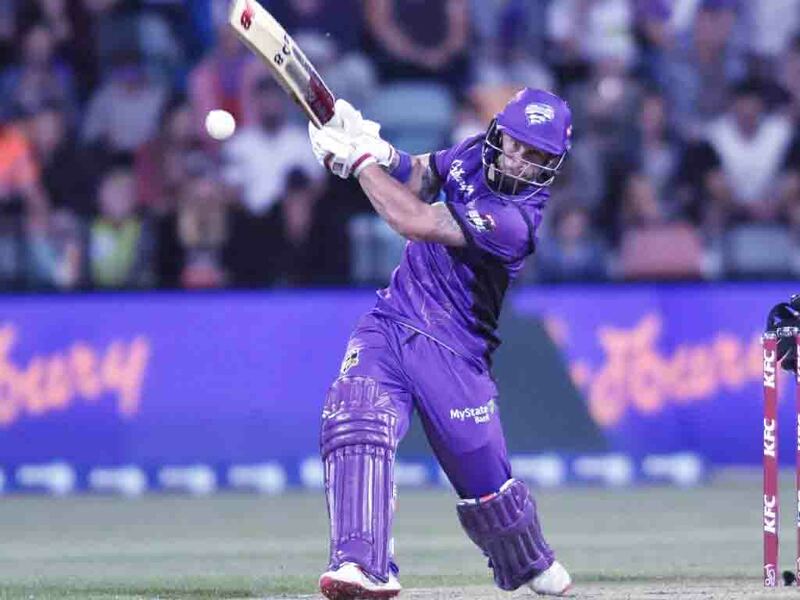 The top of the table Big Bash League clash between the Hobart Hurricanes and Sydney Thunder has not disappointed with Hobart chasing down a massive total to remain undefeated. Jos Buttler crushed a huge 89 off 54 balls in the Thunder’s total of 6/193. But it proved to be too little as the Hurricanes timed its run perfectly, winning with five balls remaining. The Hurricanes openers Matthew Wade and D’Arcy Short combined for a 120 run partnership before Short was run out for 58 off 39. Wade continued to hit, smashing 85 off 49. But when he holed out to third man in the 18th over, there were still 27 runs to score off 16 balls. Thunder bowler Sam Rainbird also dismissed Ben McDermott for 22, leaving 25 runs off 12 balls. Experienced Aussie star George Bailey took it upon himself to bring the Hurricanes home, taking Daniel Sams for 21 off the over. Two late no balls proved crucial with the first going for six, while the winning runs were brought up by Simon Milenko off a free hit. Bailey scored 23 not out off 10 balls. Wade’s 85 proved match-winning and after he was dismissed said he was happy to get some runs. @7Cricket | Watch live now on Channel 7 + get Features & Interviews on the 7Sport app. It was a tough day for the pace bowlers with Sams hit for 54 off his four overs, while Jofra Archer was smashed for 47, while he claimed the wicket of Buttler in the Thunder’s final over. Earlier, Buttler’s 89 was his highest BBL score. The Thunder took advantage of a poor fielding performance with several dropped catches giving the visitors some help along the way. “What a sensational innings from the English Test vice captain,” Ricky Ponting said. Andrew Symonds called it “the worst fielding performance I’ve seen in the Big Bash”. He said the poor fielding saw three catches dropped and 15-20 extra runs scored as the Thunder got to 6/193 from the 20 overs. Some late hitting from Chris Green, who smashed a quick 26 from 14 balls, helped the Thunder build the massive score with a 66-run partnership with Buttler taking only 30 balls. 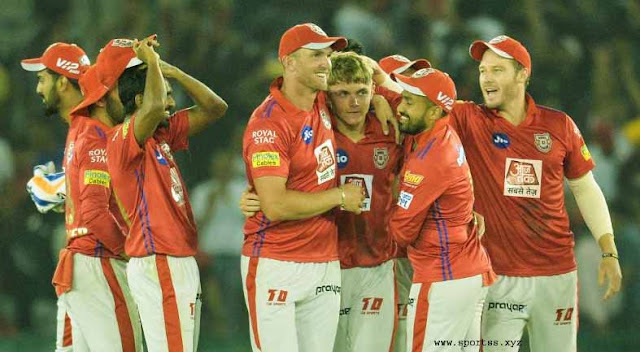 Archer was smashed with 1/47 off his four overs, making him the most expensive bowler of the night so far, while James Faulkner (2/34) and Clive Rose (2/39) stopped the Thunder from getting away completely. 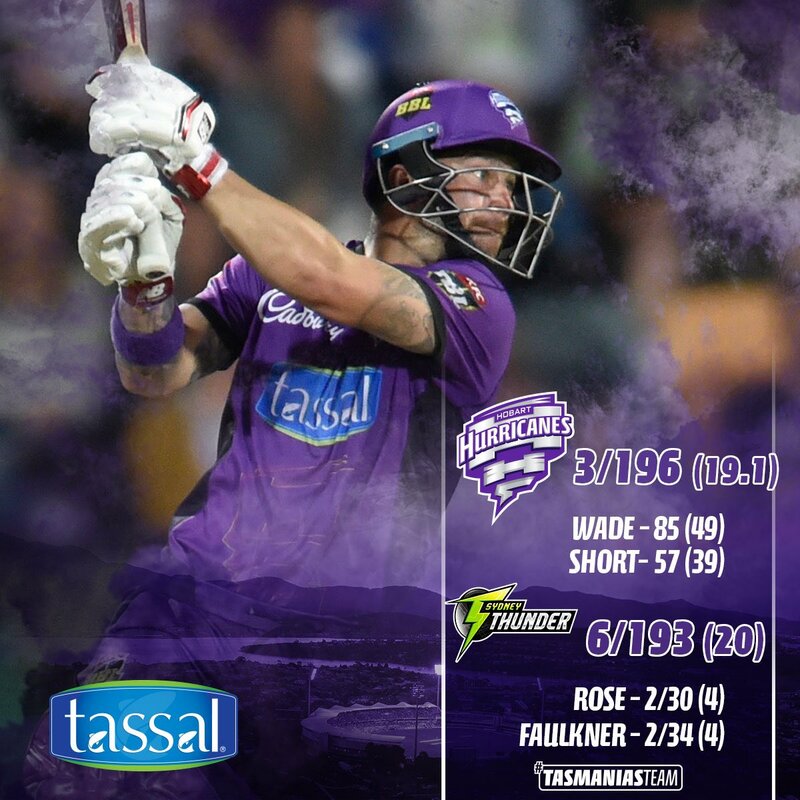 Matthew Wade hit an incredible 85 off just 49 balls to get the Hobart Hurricanes within sight of a huge chase. Going after 193, Wade paced his innings perfectly and with seven fours and four sixes after sharing a 120 run partnership with D’Arcy Short. A wide outside edge ballooned down to third man with Joe Root taking the catch. Just a few balls later Rainbird clean bowled Ben McDermott to bring two new batsmen to the crease. A 120-run opening partnership has come to an end with a hesitation and confusion costing D’Arcy Short his wicket. “They were both in no man’s land,” commentator Greg Blewett said. It sees Short depart for 57 off 38 balls. The commentators had been discussing a wicket being a important for the Thunder to stay alive. Callum Ferguson said “we really needed that”. The Hobart Hurricanes have shrugged off a horror fielding performance with Matthew Wade and D’Arcy Short pacing their innings perfectly. The pair cruised past the 50 run partnership in the power play and were putting the Thunder pacemen to the sword. Sam Rainbird, Daniel Sams and Nathan McAndrew have gone for 15, 14 and 15 off their three overs, while the Hurricanes hitters have paid much more respect to the spinners. “Perfect launching pad to have a big crack at this total,” one of the commentators said. After eight overs, the Hurricanes were 0/78. First it was Johan Botha, now it’s James Faulkner — the Hobart Hurricanes have a case of the dropsies. Botha’s one may hurt more as it was Jos Buttler in the fifth over when he was on 12 but both were fairly easy chances. Faulkner had a mistimed pull from Chris Green lob up and spin out of his grasp. “It’s like the man flu, it’s very contagious dropping catches,” Bailey said. “You get a little bit nervous and a little bit of trepidation unfortunately. James Faulkner has broken through with a huge wicket for the Hurricanes. He was taking the pace off the ball but the ball out the back of the hand, which commentator Ricky Ponting said had given him so much success for Australia. It sets the match in an interesting balance with Jos Buttler still out there having brought up his 50 as the Thunder fall five down. English skipper Joe Root was off to a great start with 17 off 12 but a rookie error hurt the star. Commentator Ricky Ponting said the shot, a slog sweep, was “a classic case of being too worried about that short boundary”. It has still been thumping start for the Thunder with 3/96 off 10 overs. Johan Botha dropped an absolute sitter and while that may have been bad enough for the home side, the rest of the over was a horror show Hobart. After the drop, Jos Buttler crunched 15 runs in the next four balls before Callum Ferguson hit another four to make it 19 off the over. Shane Watson had lost both the bat flip’s the Thunder had had before this match, and he maintained his perfect record against the Hobart Hurricanes. Hurricanes captain Matthew Wade has won the bat flip at Blundstone Arena. As has become tradition in the Big Bash this season, the Wade sent the Thunder in to bat. The Thunder have won both their games so far batting first and it’s Shane Watson’s third straight flip loss. While modern cricket has made the toss hugely important, the Thunder have relished batting first in the BBL, scoring 350 runs in their first two maches. Ian Healy explained why it had become a trend in this season’s BBL. “They’re better at chasing than we once were and the side batting first struggle to know what’s a good total. They don’t make totals as well as once was the case,” Healy said. The Hurricanes will like their chances of ending the streak, having won their last four games at Blundstone Arena. Peter Handscomb concedes he’s unlikely to break back into Australia’s Test side for Sydney, despite captain Tim Paine offering him a beacon of hope for the New Year’s match. A disappointed Handscomb wasted no time in getting back to work since being dropped from Australia’s top order for the Boxing Day Test, notably smashing 70 off just 35 balls for the Melbourne Stars on Thursday night. He’s also spoken to both Justin Langer and Australia’s batting coach Graeme Hick since the decision, with the aim to make small technical adjustments to his game that deserted him against India. Handscomb was offered a ray of hope from Paine upon his demotion, with the Australian captain insisting he was a big chance to come back into the side on the turning Sydney wicket given his ability to play spin. But while Handscomb hoped runs in the Big Bash League win over the Sydney Sixers on Thursday night would help, he figured squad balance and the fact the BBL game was his only hit out before selection meant it was unlikely he’d immediately force his way back. “It’s always nice for them (Paine) to say that. It’s going to be a tough call on their behalf as well,” Handscomb said. “Mitch Marsh is probably going to have to play if it is flat and spinning we’re going to need another bowler. And the other batters are batting really well. “To come back in the side off the back of one T20 hit is a tough call, but I’ll put my hand up and work my a*** off in the nets and hopefully something comes of it.” Handscomb averaged just 14 in his four innings against India - caught cutting twice because he was late and trapped LBW once after not moving forward to a half volley. It prompted not-so-unfamiliar questions about his unorthodox technique. “I’ve gone about trying to tinker with a couple of things,” Handscomb said. “Working with JL, working with Hickey, having some good conversations about what we think needs to be done to score runs. “It’s a bit mentally and a little bit technically as well. It’s the same old conversation that has been happening with my technique for however many years now. “I’m sort of sick of talking about it, but it’s just good to show I can still make runs.” Regardless though, the Victorian was annoyed by his home crowd’s behaviour as they booed and jeered Marsh at times on the opening day of the Test. “It’s pretty ordinary,” Handscomb said.